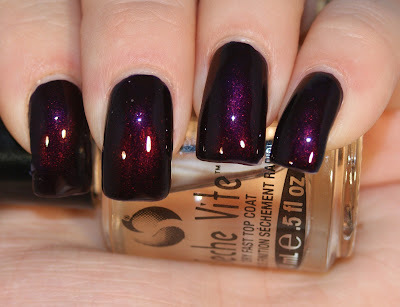 This morning, I'm bringing you something I teased at last week on the Princess Polish Facebook Page. OPI's brand new Germany Collection offers a color that piqued my interest from the get-go and that color is Every Month is Oktoberfest! I'm a fan of deep, vampy reds, which is part of the reason I love the fall. School aside, of course. Check out that color shift... it's a duochrome! It's a red-purple duochrome! Definitely unexpected. This was with two coats of polish and a top coat of Seche Vite. I wasn't too thrilled with the look of the Germany collection. To be honest, though I have Suzi and the Seven Duseldorfs on my toes, I'm still not. But really, all you need is one gem. And truly, this was it. OMG, I picked this up and have yet to swatch/wear it. This is sooo freaking pretty! I think the best looking one out the collection! I may have to get this one! I love it! !